The path to success is seldom easy. It is not always straightforward, there are often roadblocks and damn it, you always have to work harder than you want to. But with trial and error, and with time, knowledge and experience comes wisdom. The wisdom of knowing the right route for you, of understanding the tradeoff on personal cost versus outcome, and also knowing that nothing lasts forever……unless you want it to. With the Venus program we have a blueprint for success but we also have a choice, the choice of our own goal. We all see success differently – is it being a defined muscle chick, is it maintaining an awesome bikini body every day or is it an amazing transformation for your wedding day? In my transformation journey one of the hardest things has been to understand and be true to my goals. Not the ‘I want to lose body fat and be at my Venus metrics for a competition’ goal. More the how do I want to look every day, how do I achieve and maintain this. I also have a busy life, a life where I need a functional body. I do a lot of full on out door activities. My body needs to be able to perform. I have been on this Venus journey for about 18 months now. I achieved my Venus metrics during the VT1 competition and have spent the past 15-16 months in various states of maintenance. It has been a quite a journey and it has taken quite some time for me to be comfortable with my own body shape goals. Initially my goals were a little fuzzy. I wanted less fat and more muscle. Something like a fitness model. Then as I started to transform and was able to see the raw clay I had to play with I was able to get more specific. However that was when the Axis of Evil, The Trinity of Terror, The Cult of the Obsessed showed up. Otherwise known as the hijackers, the terrorists and the fundamentalists. When we transform ourselves physically, everyone has an opinion. They have opinions on the process, on our look and even on our sanity. Mostly we can sort the useful from the mundane. But what happens when we allow the goals of other people that we respect to become our own? As humans we measure things through relativity. How do I look compared to you? How heavy did I Iift this month compared to last month? I am particularly susceptible to goal-oriented challenges. I want to share a couple of examples of how I let myself be derailed this past year. I have always been clear that my goal is to be an every day Venus. For me this means being bikini ready, and while I highly admire it in others, not being a muscle chick. In an attempt to get to incredibly low body fat I kept pushing low calories, fasting and depleting. We had a number of mini challenges in the community to really push on the fat loss. This would have been fine if I had more to lose but I managed to get myself down to 98lb, at just a shade under 5’4” (161.5 cm). I was all bones and skin. I did not have the muscle to support this look, in fact I would say I lost muscle in this attempt at achieving ripped abs. I will say this openly, I DID NOT LOOK GOOD. Last year I leant to lift heavy. I realised that for most of my life I had been lifting seriously too light to get awesome results. The Venus program and the community taught me to lift. However being a very goal oriented person this quickly became a personal challenge for PBs (Personal Bests). I started collecting the PBs of experienced lifters and I went right ahead and did it. Someone would mention a 250lb deadlift……so I worked on that one and achieved it. I felt great, I was blasting out PBs most weeks but my body responded by really pumping up in the legs. To the point I did not like my look. Kind of obvious this would happen but I was stuck between the look I wanted and a serious drive to go get PBs. It took a while but I backed off the PBs, reversed out the legs and I am much happier. These are the well-meaning friends and family. We hope they will be our biggest supporters but often times their motives are unclear as our transformation challenges their perception of themselves. Many times they do not like what they see, in us and in themselves. They can try to undermine our transformation. It may be through comments about getting too thin. Or offering us known trigger foods, and pushing us to eat it. In little ways they can derail our effort. It is tough to manage this as these people are important to us and what they say can be very hurtful. It feels impolite to refuse their advice and food. Standing up for your beliefs and goals is your right and your choice. We all have to split our nearest and dearest into the camps of supporters, terrorists, and do not care. Just be aware, be covert when you need to be, and do not expect support. Remember, you cannot negotiate with a terrorist. The people who hold very strong beliefs about eating every 2 hours, or only precise macronutrient ratios. Who believe that only a certain exercise style is optimal, that their way is right and hence everyone else is wrong. Often times these beliefs have very little scientific basis but if it works for you, then that is great. For many of us all these messages, the hope for a little magic beyond ‘eat less, exercise more’ is compelling. The Goldilocks Series: Too thin, a little beefy, and just right. These are my every day happy snaps on the beach – no fasting, no flexing, no make up and a point then click camera. I am definitely a recovering orthorexic. I spent a number of years becoming increasing obsessed with low carb, eating frequently, managing macronutrient ratios, counting calories and timing carbs to workouts. This may work for some but the net result for me was putting on weight. Getting fatter despite all my effort. It has taken quite a while to build new (well old) habits but I have gone back to my old instinctive styles of eating. I eat mostly what I want but only when I am hungry and I manage the portions. For me this is freedom. This truly is “anything goes” diet. These are what you want and they do not need to conform to anyone else’s idea of great. This is your choice but we all have a confusing array of respected advice, not so expert opinions, science, junk science and emotional triggers to sort through. Just be clear about what you want. Nice job Kimberley, the true every day Venus. 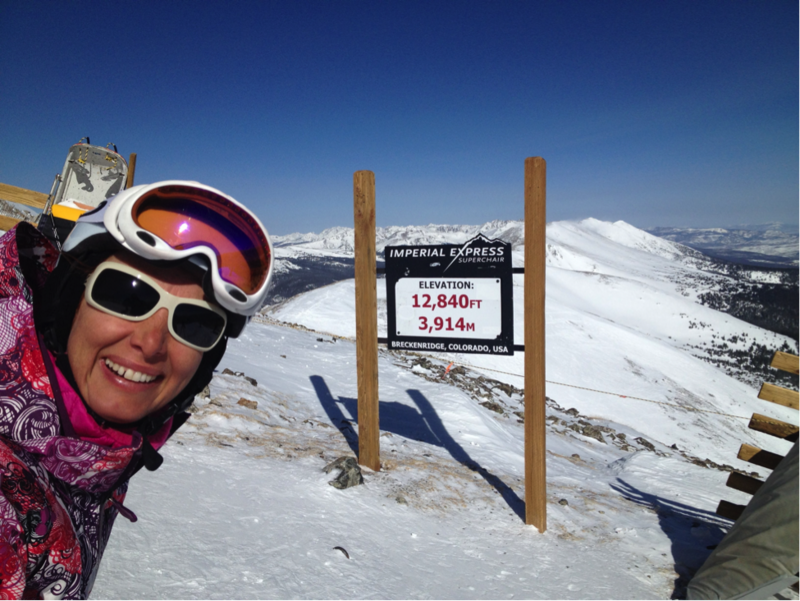 I love what you do best, double black diamond moguls! 🙂 What a studette. Thanks partner. Skiing, I cannot wait to go again. I love summer but I truly love skiing. EXCELLENT article, I can really relate to a lot of your journey..thank you for sharing. Great article, Kimmets! I’ve done a very similar series of trials during recomp and am finally settling into it with the understanding of how the long-term will play out.